Disability studies are concerned in the main with the social construction of disability. Rather than the fact of impairment, the focus is on how that impairment exists within the social processes surrounding it. Science fiction offers us many alternate ways of imagining the human, the boundaries between the human and technology, and the body in the world, and ought therefore to provide a particularly rich source of narratives pertinent to issues of disability. A disclaimer, first: I've read very little in the field of Disability Studies (DS), which is still a relatively new area of study. 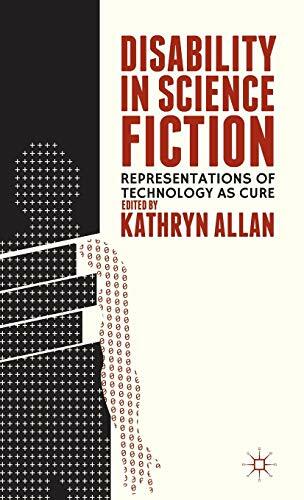 In her introduction to Disability in Science Fiction , Kathryn Allan claims that her aim is to make this collection accessible to non-academic SF fans as well as academics within the field, and it is from that perspective that I must approach it. Allan chooses to allow for a deliberately broad definition of science fiction here, a decision she attributes to a desire to showcase a range of possible approaches to disability, as well as to make the book accessible to a wider audience. As a result, most of the texts analyzed here are in the form of short stories, film and TV, and novels, both "core" genre (John Varley, Elizabeth Moon, Robert Silverberg) and part of the popular culture mainstream ( Star Wars , Avatar ). Since this is among the earliest (if not the earliest; I can't find an older one) collections of work on SF and disability, it is probably wise at this stage to choose a breadth of coverage rather than depth, but it might make a unified reading of the book difficult. In the normal course of events few readers are likely to read through a collection of academic essays from start to finish—the question of how the book works as a whole is more likely to trouble reviewers. I'm not sure that's true here—as I mention above, Allan has spoken of wanting to bring these debates to a wider SF audience, and in a sense the book is a selection of the ways in which DS can shed light upon the ways in which we read SF. Rather than narrowing it down by genre category or to a particular branch of the academic discipline, she chooses instead to focalize it around the central question of the cure. What does it mean to need curing; to what extent and what ways does science fiction represent (or undermine) technology as it is applied to what Sally Chivers and Nicole Markotić describe as "problem bodies" (p. 116)? The book is divided into three sections consisting of four chapters, each of which ostensibly focuses on some aspect of this larger question. The first of these offers a general understanding of the ways in which DS can inform a study of science fiction. Joanne Woiak and Hioni Karamanos's essay on Samuel Delany's The Einstein Intersection (1967) opens the collection. It is titled "Tools to Help You Think" and that title turns out to be more apt than expected. Woiak and Karamanos address some of the many ways in which disability specifically and a more general sense of otherness operate within the text—and at one point take a detour into a form of biographical criticism. It's a bit scrappy, and has the sense of being a series of notes for possible ways of applying this discipline to this text, yet I'm not sure this is a real flaw. What emerges from it is a sense of text and criticism as interlocking machines, opening up possibilities. In a sense, it's attempting what the larger collection is attempting, only in microcosm. A mild but recurring annoyance, in this piece as well as others, is a seeming need to defend SF and its study. It's easy to see where this impulse comes from, but the reader of a collection of academic essays on the genre probably does not need to be convinced that the field has value. Ria Cheyne's discussion of John Varley's "Tango Charlie and Foxtrot Romeo" suggests that the way in which a text treats disability may function as a marker of genre. The story in question draws on both crime fiction and SF traditions. Cheyne compares the contrasting attitudes within the story to the disabled bodies of three major characters, and concludes that the disgust directed at two of the characters has its roots in detective fiction's tradition of associating disability with deviance and villainy, while the story's celebration of Megan Galloway's body stems from SF's ability to radically reimagine the body. It's very well done and this analysis of shifting genres is the sort of thing I love, but its celebration of SF's potential treatment of disability is complicated by later essays in the book. The second part of the book deals with the idea of the prosthetic, defined broadly by Netty Mattar in her essay as "any artificial intervention that alters the 'normal' operations of the human body, where 'normal' is understood to be a culturally specific and variable idea" (p. 75). Across the four essays that make up this section this can refer to anything from the prosthetic limb (Donna Binns's chapter on The Bionic Woman ), to Darth Vader's breathing apparatus (in Ralph Covino's chapter) to alien or animal bodies (in Leigha McReynolds's essay). McReynolds's piece on the human-alien or human-animal partnerships at the center of Avatar (2009) and How to Train Your Dragon (2010) is one of the most enjoyable pieces in the collection, in part because of the contrasts between the two texts. But particularly in the case of Avatar , where so much has been written about the movie's more uncomfortable aspects, this is a reading that could benefit from a more intersectional analysis. Mattar's piece on Peter Watts's Blindsight (2008) and Ian McDonald's River of Gods (2004) has the opposite issue, that of possibly taking too wide a scope. Mattar situates the use of technology upon human bodies in both texts in the wider context of the workings of capitalism, and for the most part this works well. When, however, the question of cultural difference comes into play in River of Gods , she's forced to lean heavily on telescoping generalizations; we're told, for example, that "Indians" view disability as the result of karma. Perhaps it is because the field is still seen as new, or because few of the authors here work primarily in DS, but a useful feature of this collection is an unwillingness on the part of the individual writers to take the reader's knowledge of the subject for granted. As a result most chapters begin with an overview of the theory upon which the author is drawing. This is helpful for the reader, and it is especially successful in this central section, where the theoretical sections of the four chapters work together well. The individual discussions of texts may be somewhat superficial (I'm unconvinced that the framework within which Ralph Covino reads the Star Wars movies is a particularly productive one) but read as a whole this section is fascinating. Where the discussion of prostheses raised the issue of the boundaries between the human body and technology, the final section of the book deals with the posthuman. As Brent Walter Cline notes in his piece, the reality of the body as part of human identity is integral to DS, and so its relationship with posthumanism may often be uncomfortable. His discussion of Olaf Stapledon's Star Maker (1937) and Greg Bear's Blood Music (1985) questions the ways in which the body is constructed as impediment or obstacle. Gerry Canavan's chapter on science fictional depictions of Huntington’s disease is the strongest in the collection, taking for its context a larger "dialectic between pessimism/constraint and optimism/agency" in genetic science. I'm not sure that Christy Tidwell's chapter on the depiction of autism in Elizabeth Moon's The Speed of Dark (2002) and Nancy Fulda's "Movement" belongs in this section. Tidwell provides a few instances of aliens and other non-human characters in SF being associated with autism, but her focus seems to be on the representation of autistic characters in fiction in a very general sense (and a very particular sense, with reference to Moon and Fulda's work) rather than on the possibilities of this genre in particular. It's a good piece, but it feels as if it is part of an entirely different conversation to most of the rest of the book. Maybe that's part of the point, though. Disability in Science Fiction seems to present a selection of possibilities rather than an overarching argument (a sort of critical buffet) —though these possibilities can feed off each other in exciting ways. Other works and collections will hopefully build on some of what is here; Allan's collection is a good beginning.